RIVBOS Sport Sunglasses Are Designed for Driving, Cycling and all Outdoor Activities. Lens Made of Shatterproof Unbreakable PC Material are Durable Enough for Long Time Using Only The Main Black Lens is Polarized Lenses Against Strong Sunlight, the Other 4 Lens are Colored Sunglasses for Different Environmental Condition. Come With an Elastic Sport Belt Which You can Interchange it As and When You Like it to be Strap or Bow. More Comfortable With Spare Rimmed Soft Rubber Pad. Nice, Trendy and Cool to Wear. 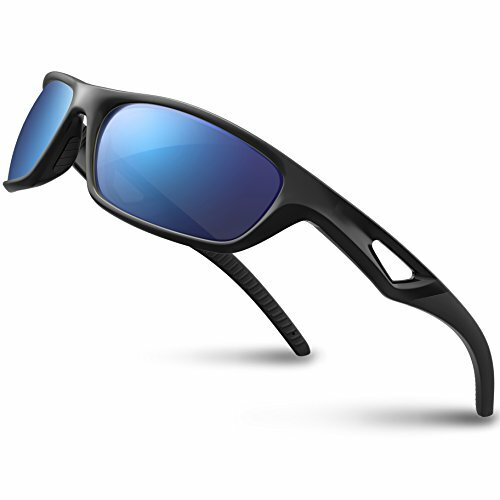 a.TAC Polarized Lens- Offer Top UV Protection filtering 100% of all UVA/UVB/UVC and Harmful Blue Light Up to 400nm.Restore true color, eliminate reflected light and scattered light and protect eyes perfectly.The lens of RIVBOS Polarized Sunglasses reduce glare reflected at some angles off shiny non-metallic surfaces such as water.They allow wearers to see into water when only surface glare would otherwise be seen,and eliminate glare from a road surface when driving into the sun.It's good to wear our sunglasses while u driving finishing and all kind of outdoor sport activities. b.Super Lightweight,Stylish,Durable-Lightweight design is ideal for usage by motorcycle and cycling,bicycle ,driving,running,fishing,racing,skiing,climbing,trekking or other outdoor activities enthusiasts.Fashion and stylish sporty design,with rich colour combinations of frames and lens. c.Package&Accessories:Each RIVBOS Sunglasses are Packed in Hard Protection Portable Case and Colour Box,Pouch/Strap/Cleaning Cloth ect. included. d.Lifetime Breakage Warranty On Frame & Lens - Frames and lens are unbreakable for no risk purchasing. In case any broken problem happens, contact the seller of RIVBOS without hesitation to solve the problem until satisfaction.